Apple Stores are a phenomenon - they’ve undergone tremendous growth in the past couple of years, and are a huge part of the success story that Apple has turned into. At the same time, though, Apple Stores are mostly a US phenomenon. An overwhelming majority of Apple’s retail location, 246 out of the total 364, are in the States. If you add 33 more in the UK and 22 in Canada, that makes up nearly 87% of all stores, and they're all in North America and the UK. And it’s a huge paradox for a number of reasons. Apple’s growth has surged all across the globe and most notably in China, which recently surpassed the States in terms of mobile subscribers and is now officially the world’s biggest phone market. 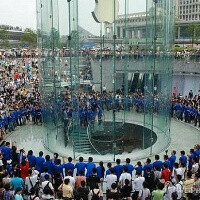 This is a serious hurdle for Apple sales in China, a country where people have to wait in impossibly long lines for iPhone repairs. And while the population of China has grown to 1.3 billion and Apple has six stores there, In contrast, Pennsylvania, a state of 12.7 million people, has eight Apple Stores, with three located in Pittsburgh alone. It’s clear that demand for Apple products in China far outweighs the supply. Also, it’s clear that Cupertino isn’t moving as planned. Two years ago when Ron Johnson was still the head of Apple retail, the plan was for Apple to open 25 stores by 2012. So far, the company is doing more than great - it reaps virtually all the profit in the industry leaving a bit for Samsung only. But failure to expand in China might hurt it not only in the short-term, but also the sustainability of the company. And there are some regulatory challenges with opening stores in the Asian country, and it might not all depend on Cupertino, but it seems that despite its sunny present the company would better try and make its retail presence known in China as well. Ho ho !! what happened to ''Apple Care '' in china?? They cant penetrate the asian market due to piracy and poverty. The monthly wages of the majority of people is way too low that buying an igadget is way to expensive. The competition there is too strong that they have all this budget smartphone from Brands you never heard of. Its not happening, they tried it before with Macbook and they failed.